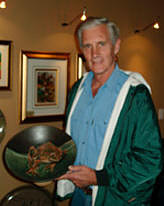 Garth Chase Hoets was born in Johannesburg in 1944. His education took him through King Edward VII School and and then onto the University of the Witwatersrand where he qualified with a degree in Chemistry and Marine Biology. It was while teaching high school in Johannesburg that Garth started taking pottery lessons part-time with his brother, well-known potter Digby Hoets. After embarking on a farming venture in the Northern Province near Tzaneen, Garth started teaching pottery part-time and holding small exhibitions and workshop demonstrations locally. Eventually Garth moved to Hilton, in the Natal Midlands area, where he opened his own pottery studio, devoting himself fulltime to his work as a ceramicist and clay sculptor. Garth was a member of the Natal committee of the Association of Potters of Southern Africa (APSA) for a number of years as well as serving as chairman for some of that period. Nominated as a selector and judge for past Natal Regional and National Exhibition entries, he has participated in most regional and national exhibitions since 1981. Currently Garth teaches all aspects of pottery, and creates original ware - some for exhibition, as well as on commission for various game lodges, conference centres and galleries.